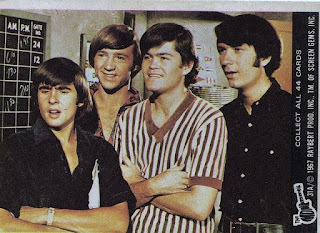 The Monkees have a new song, and a new album coming out. One of my friends sent me a link to this song and I have listened to it several times -- I absolutely love it. "She Makes Me Laugh" was written by Rivers Cuomo from Weezer. It is such a catchy little tune with a jangly bubblegum pop sound that is so much fun. I also love the video, which has a unique and clever retro comic book motif. Just watch and see! I have always liked the Monkees. I love all their retro songs, but have a special place in my heart for "Pleasant Valley Sunday" (which I think is a perfect pop song) and "Steppin' Stone." I'd love to hear from you in the comments. What do you think of this new Monkees tune? Do you have a favorite of their songs? Your description of the song was spot-on, and I LOVED the video. I love this song! So catchy. New music from the Monkees? I thought they were an older band and have retired. I used to watch their old sitcom on televsion years ago. Thanks for stopping by! I loved the video, too. Cascia, I also was surprised by new music from the Monkees - a fun surprise, though!